How does nukemap 3D work? 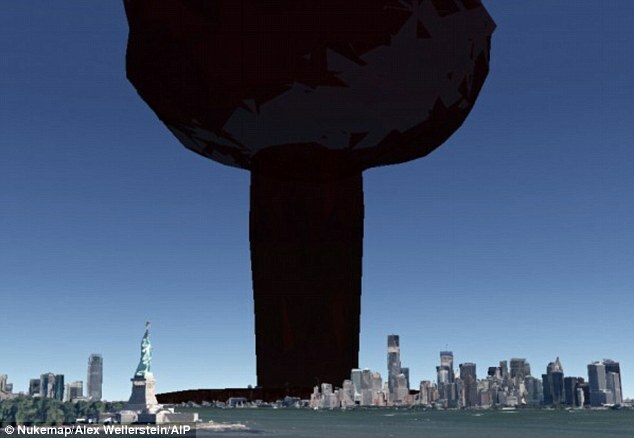 The Nukemap 3D uses Google Earth images to simulate the nuclear attack and bases the animations on how mushroom clouds have behaved during various tests since the 1940s. Users can select a location, choose their weapon and their viewing location, and see the bomb drop and the cloud develop real-time. The altitude of the cloud, how far it spreads and the number of casualties is also shown. Casualty numbers are based on how many people live in that region and their various distances from ground zero. Nukemap 3D is the third in a series of nuclear bombing simulators created by historian Alex Wellerstein from the American Institute of Physics in Mayland. According to Wellerstein, the map was designed to provide a visual and accurate simulation of what would happen if a nuclear bomb was dropped on any city in the world. It was also created to give people a better understanding of how it would affect their hometowns or places they are familiar with. And the map can highlight the varying levels of nuclear bombs and their respective threat. Casualty numbers quoted on Nukemap are based on how many people live in that region and their various distances from ground zero. This population information was bought by the Centre for History of Physics at the American Institute of Physics. The behaviour of the clouds is based on equations by E. Royce Fletcher, Ray W. Albright, Robert F.D. Perret, Mary E. Franklin, I. Gerald Bowen, and Clayton S. White, as well as U.S. Atomic Energy Commission Civil Effects Test Operations, written in February 1953, and Samuel Glasstone and Philip J. Dolan’s The Effects of Nuclear Weapons, 1964 edition. The bombs Nukemap users can choose from include a North Korean bomb tested in October 2006 as well as the ‘Little Boy’ Hiroshima bomb and the ‘Ivy King’ – the largest known pure fission weapon ever tested. Each bomb is shown with its relative yield in tonnes or kilotonnes, which determines the size and impact of the nuke. Wellerstein adds that all of the information used to create the Nukemap 3D is publicly available and doesn’t provide any secret data. 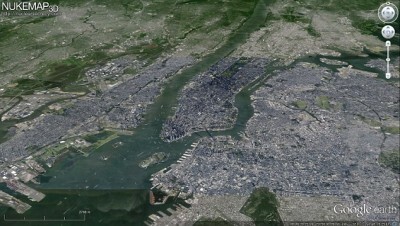 Because the Nukemap 3D uses Google Earth images, users must have the Google Earth plug-in installed on their browser to use the map.